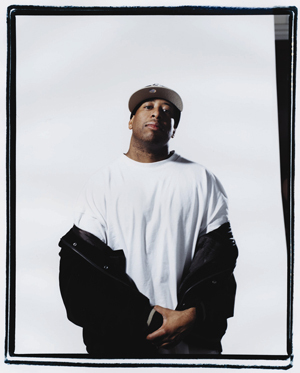 No more than three producers (Dr. Dre, RZA, and Prince Paul) can test DJ Premier's status as the most important trackmaster of the '90s, and no style is more distinctive. Aggressive and raw, a Premier track was an instantly recognizable soundclash of battling loops and heavy scratching — all of them perfectly timed — that evoked the sound of Brooklyn better than anyone. Besides helming tracks for his main concern, Gang Starr, since their 1989 debut, Premier's productions appeared on many of the East Coast's most important records: Nas' Illmatic, the Notorious B.I.G. 's Ready to Die, Jay-Z's Reasonable Doubt, Jeru the Damaja's The Sun Rises in the East, and Mos Def's Black on Both Sides. Premier, born Chris Martin, spent time in Brooklyn and Houston while growing up, and studied computer science at Prairie View A&M outside Houston. Known as Waxmaster C, he'd already learned to play a variety of instruments and also managed a record store. After moving back to Brooklyn, around 1987-1988 he came into contact with Guru, a Boston native. Guru had already formed a group named Gang Starr two years earlier (and recorded with the 45 King), but his former partner, Mike Dee, had returned to Boston. DJ Premier and Guru signed to Wild Pitch and released a debut single ("Manifest") and album (No More Mr. Nice Guy). Gang Starr's interest in melding hip-hop with jazz informed the record, and they were invited to add to the soundtrack for Spike Lee's 1990 film Mo' Better Blues. Their subsequent work was much more mature and unified, with a pair of instant East Coast classics (1991's Step in the Arena and 1992's Daily Operation) arriving in short order. "“In a word, the TTXUSB is solid. I use it all the time.”"